Sae is popular and loves sweets. 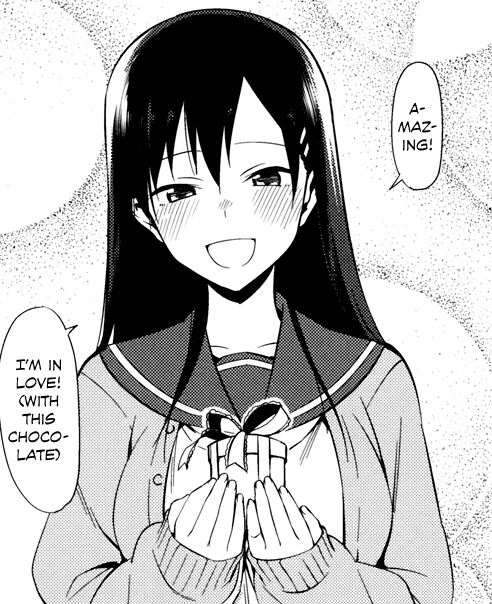 She receives a lot of chocolates on Valentine’s Day. Her boyfriend Mutsuki is just the opposite; he doesn’t get any. Sae senses his unhappiness and decides to give him a present to lift his spirits on their way home. I’m honored to present this story, the last known work by lunch that hadn’t been translated into English yet. It has some special significance to us because our group is named after lunch’s one and only tankoubon, Koinaka. It’s still sad that lunch completely vanished from drawing manga, adult or otherwise, after 2012. Sou and his childhood friend “Kurako” are the only members in their university’s game club. When Sou is alone, he spends his time playing adult visual novels. One day, Kurako surprises him when he’s deeply engrossed in a session. With regards to future chapters in this series, I believe we will still work on them. We weren’t able to do chapters 2 and 2.1 because the editor dropped out without informing anyone, but this shouldn’t happen again in the future. We’ve had a Discord server for several months, and I meant to mention it sooner, but I was lazy. It seems that last night, during Fakku’s panel at Anime Expo, they announced they were picking up three new magazines to publish. They are COMIC BAVEL, COMIC Europa, and Girls forM. We’ve never scanlated anything from Europa and Girls forM, so that doesn’t affect us. But we do have ten releases from COMIC BAVEL, as well as the current story I’m working on. Of course, this means we will no longer scanlate material published in COMIC BAVEL. I don’t know what to do with the current project. I suggest grabbing the releases if you haven’t already, as we may have to take them down in the near future. Or perhaps we will preemptively remove them to cover our backsides, either way. Get them while you can. The broader implication is that Fakku has spread beyond WANIMAGAZINE. I mean, I know they did pick up some tankoubon published by GOT (Anthurium’s publisher), so it’s not a complete surprise. But Girls forM is Akaneshinsha and COMIC BAVEL/Europa is… I forget its name, but that was the publisher who used to do Purumelo. The question is what’s next? COMIC KOH (Akaneshinsha)? Anthurium (GOT)? Hell, who’s to say they won’t get AUN (Hit Publishing) or HOTMiLK/Megastore Alpha (CORE) in the future. Point is, nothing is safe anymore. I’m not sure what this means for us moving forward, but this is a blow to the eromanga scanlation scene, the biggest since WANIMAGAZINE’s DMCA spree two years ago in my opinion. It’s very disappointing news to me, to say the least.